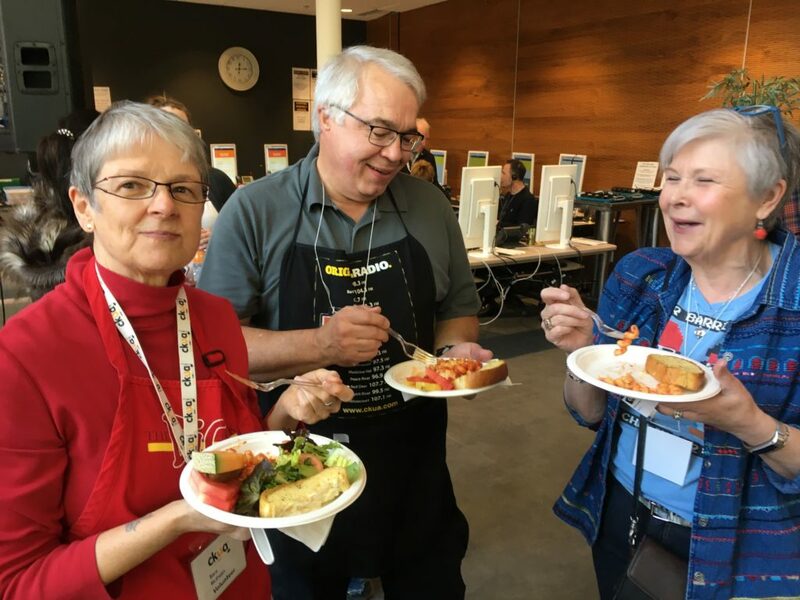 CKUA volunteers fuel our fundraisers. Over 150 energetic souls put in over 1,650 hours per campaign. Their hard work is crucial to CKUA staying strong. But if they fuel the fundraiser, who fuels the volunteers? The answer: a group of generous, community-minded restaurants, caterers and grocers! During a fundraiser, volunteers answer phones, manage data, keep everything organized and more. It’s fun, fast-paced and social. It requires energy. So, beyond the bevy of available snacks, several times a day people walk in bearing delicious-smelling meals. Deliveries include everything from po’ boys from DaDeO New Orleans Diner and Bar, chicken primavera pasta from Chianti Café and pulled pork on Portuguese water buns from Juniper Café and Bistro. Snacks run the gamut from warm chocolate chip cookies from Cookies by George to fruit and snacks from Blush Lane Organic Grocery. The in-person discoveries are in addition to the on-air mentions reaching hundreds of thousands of listeners. Benefits vary depending on the level of donation but every single donor receives recognition on-site and on-air. The owners of Chianti Café have been donating to CKUA fundraisers for years. Ken Rubuliak says that just a few weeks ago, a customer had said that it was a CKUA on-air mention that brought them to the restaurant. “They specifically said they had heard of our support of CKUA and wanted to come here. It was nice to get that feedback,” he says. That kind of connection is exactly what CKUA is looking to provide in return, to thank our food donors. “It’s important that we keep it local, so we can provide that reciprocal value by letting people know about the awesome food donors who support CKUA,” says Breanne. Between 30 to 40 local food donors feed our fundraisers. “I don’t think people realize how much food is being donated, how much is being consumed and how appreciated it is,” says Breanne. If you have an awesome restaurant or catering company and would like to help fuel our future fundraisers, we’d love to hear from you! Please contact Breanne Coffill at 780.428.2047 or bcoffill@ckua.com.